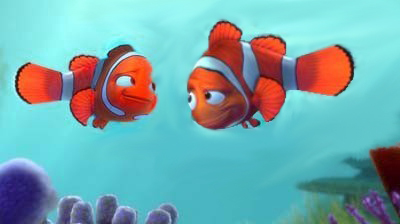 The movie opens to a scene of three lovely young clownfish and Coral is recognizable right away. The three friends are swimming in a line, talking and laughing. 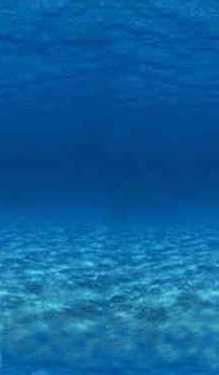 The camera pans out to encompass a wider view of the ocean and a young Marlin can be seen swimming towards the group. He seems distracted as he swims, his eyes looking downward instead of forward. He bumps into Coral as he passes her. Marlin stutters, “Excuse me!”, as he glances up and does a double take when he sees Coral. She giggles before swimming away with her friends. Marlin, with his eyes bugged out, says, “Wow!” and turns around to follow after the group. We see Coral and her friends enjoying the day, chatting with other sea life and stopping to eat lunch. Marlin is never too far behind; he either hides behind seaweed or pretends to be studying rocks whenever he thinks Coral is looking at him. Finally, Coral waves goodbye to her friends and continues on her way, alone. Marlin sees this as his chance and swims faster to catch up. Just before he reaches her, Marlin gets tangled on a loose piece of fishing wire floating in the sea. Coral hears him as he struggles to free himself and turns around. “Oh no, do you need help?” she asks Marlin. Marlin doesn’t answer, he’s still wriggling to get himself untangled. He looks up at her as he realizes she’s next to him and stops struggling. “Yes, I’m stuck and…well, there’s a fish hook in my lip.” Marlin replies. Marlin tells her to look closer, the hook is way in there. Coral comes even closer until the two are nose to nose, if that’s possible with fish. Coral looks at Marlin's mouth and then into Marlin's eyes and bats her eyelashes. She says, "You're kinda cute." Marlin smiles a little smile before kissing a surprised Coral.